Research on the Anthropocene has proliferated over the last decade. More and more disciplines have adopted the Anthropocene as a legitimate area of study. With this widespread interest has come a flood of publications, art installations, research projects, and media coverage. For beginners and experts alike, getting a handle on all the work being done on the Anthropocene can feel like drinking water from a fire hose. We created An Anthropocene Primer to provide learners with an entry point into some of the big concepts and debates that dominate discussions about the Anthropocene. After working through the primer, you will find it much easier to deal with that firehose of information. It is neither comprehensive (this is, after all, An Anthropocene Primer, not The Anthropocene Primer), nor is it didactic. We designed the primer as a framework to guide individual and collaborative learning. As you encounter new work on the Anthropocene, you will be able to give it context. Terms and concepts that once felt unfamiliar and strange will have meaning and relevance. An Anthropocene Primer is a living document. We will continue to supplement content via the blog. The blog will include commentary on new publications, findings, emerging themes, and current affairs. It will also feature items such as podcasts and interviews. 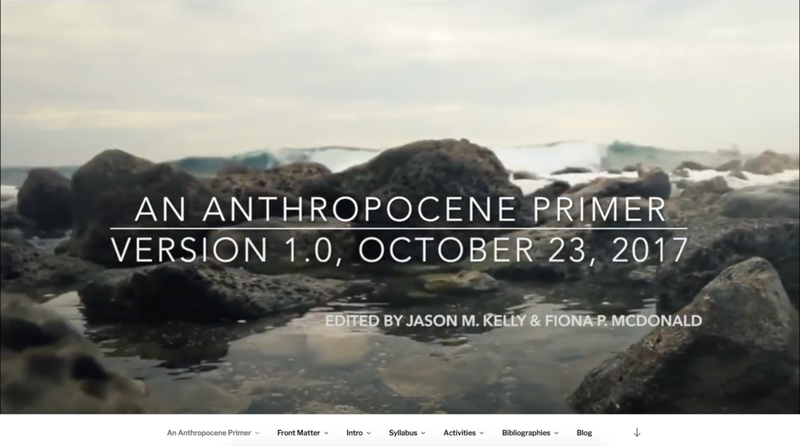 Version 1.0 of An Anthropocene Primer is hosted by the IUPUI Arts and Humanities Institute as an open access book, which we are releasing during Open Access Week in October 2017. In collaboration with Indiana University Press, we are inviting the public to participate in an open peer review of the volume until February 1, 2018. Directions on how to participate in the open peer review of this book are detailed below. It’s really simple. All you need to do is highlight a section of text on which you want to comment and choose “Annotate” from the pop up menu. The first time you comment, you will need to type your name and email and choose a password. We will use this information to credit you as a collaborator in the printed version of this book.